Ten years ago, I was working as a Systems Engineer in an IT services company. Back then a lot of the work involved implementing physical server hardware (HP ProLiant servers), installing and configuring Windows Server, network infrastructure and implementing Exchange and SQL Server. An opportunity came up to work on a project implementing Microsoft Office SharePoint Server (MOSS 2007) for a client. My only exposure to SharePoint had been the ‘CompanyWeb’ on Small Business Server. The client had straight forward requirements and a basic out of the box install with a few document libraries was the initial deliverable. The next couple of years would see the site grow in a way we would later describe as “organic”, with subsites, more libraries, more subsites, lists, calendars, nonsensical navigation and the obligatory security mess. Despite this the users were (mostly) happy, possibility because anyone who asked was given Full Control without a second thought. Roll forward a few years a decision was made to upgrade to the newly released SharePoint 2010 Server. The detach / attach content database method was chosen and while the upgrade itself was painless it didn’t address the structural issues. A steering group was formed and tasked with resolving issues and implementing more functionality. The navigation was improved, branding was added, custom SharePoint solutions were developed and deployed into the farm, the User Profile Service was implemented, InfoPath and SharePoint Designer workflows started to appear. SharePoint started to get momentum in a few areas of the clients’ business, but others complained that “they couldn’t find things in search” and issues with permissions continued to generate support tickets on a regular basis. More customisations were made, some better than others. We learnt more about the GAC and manually editing Web.Config that we should have. When Microsoft announced SharePoint 2013 the steering committee was convinced it would solve a myriad of problems from oversized Content Databases to Search issues and almost everything else. We tried a test upgrade and it failed. Customisations didn’t migrate well, the branding looked awful and it didn’t solve the legacy issues from more than 5 years of organic development. A project team set about redesigning SharePoint from the ground up. A decision was made to focus on configuration rather than development so that future upgrades would be easier. Permissions were simplified and standardised on Contribute and Read rather than Full Control or nothing. The branding was refreshed and finally got the tick of approval from the comms team. Navigation was standardised across the entire site. Time was spent improving Search. There were still some issues with SharePoint but user adoption had improved and some areas of the clients business we asking for sites to meet specific business needs such as policy development, forms and workflows for business processes, project areas etc. It was around this time that the client started asking for external users access for collaborating with partners and to give users access to forms and documents outside the office. IT weren’t keen on this and decided to implement a VPN solution which really didn’t make it easy to get to the things users needed. Roll forward to 2018, ten years after I did the initial install and I’m in a meeting discussing migration to Office 365 including SharePoint Online. Collaboration both internally and externally were high on the priority list. They decided to go with Modern Team and Communication sites, document libraries will be migrated with the SharePoint Migration Tool. Related sites will be connected using Hub Sites, with shared site branding and navigation. We have a lot of work to do with forms and workflows, we’ll evaluate each one and decided if they come across as is or we rebuild with PowerApps and Flow. This site in many ways has helped shape my career, it has taught me many lessons, kept me awake at night, given me moments of happiness and anxiety! In the beginning 99% of my work was around implementing the infrastructure and configuring SharePoint, these days infrastructure accounts for perhaps 5% of my work with SharePoint, the rest is spent working with business teams to get the most out of SharePoint and how to move to the cloud. I never imagined where the MOSS site would end up after ten years and right now I’m wondering where it will go in the next ten. So here I am at the Microsoft MVP Summit, sitting in a room filled with faces I recognise from blogs I’ve read, Twitter accounts I follow and conference speaker lists I’ve browsed. It didn’t take long to realise I was in the right room, everyone as engaged in conversations around SharePoint and Microsoft Teams with the occasional Yammer or OneDrive mention. I was a little bit star struck at first! While I can’t tell you anything about the things we are being shown due to NDA, I can tell you about the experience of being a first time MVP at the global MVP Summit. This is an opportunity for the product teams at Microsoft to engage with community to get feedback on ideas, gather suggestions and have an open and frank discussion. As an MVP I have the opportunity to be the voice of my clients and local community. I can contribute to the ideas being discussed, give feedback and make suggestions to help Microsoft build a better Office 365 and SharePoint for everyone. It is good to hear others articulating their needs, issues and ideas. It’s also great to hear from the product teams themselves drilling into the suggestions to get further detail or clarify a point. My excitement levels started rising as I caught the summit bus from a hotel in Bellevue. Fifteen minutes later I arrived at the Microsoft Campus in Redmond. This place is big (500 acres), buildings, a conference centre, visitors centre, football fields and trees. It reminded me of a University campus with better quality cars in the parks (spot the Tesla is very easy here). It feels like a great place for techies to work and while you don’t see lots of geeks (takes one to know one) on experimental forms of transport, you do see a diverse workforce with the same goal, to empower every person and every organisation on the planet to achieve more. Microsoft really is a global company not only in terms of sales territories but also in the people it employees. Brilliant! The company store is in Building 92, the same building I was in for SharePoint and Office 365 related sessions. I looked long and hard but couldn’t find a Clippy t-shirt, but they did sell a lot of clothing with Azure, Windows, X-Box and Microsoft Office branding. You can also buy lots of things like mugs, caps, notebooks (paper variety), Minecraft and a variety of hardware and software products. A few weeks before the Summit I joined a mentoring initiative organised by Microsoft. This lead to an invitation to a meeting at the Microsoft Treehouse, a meeting room in the trees. This venue has no power, no WiFi, no whiteboards and not heating (it was a little chilly), the perfect place to focus on a human to human conversation without distraction. The meeting was a very small group, just 12 of us with Laura Hunter, Principal Programme Manager for Security CXP at Microsoft. The discussion was insightful and I came away with some new ideas and contacts. You can learn more about the day in this Microsoft Blog on International Women’s Day. More than 2000 people from 80 countries are attending the MVP Summit. This brings real depth and different perspectives to the feedback sessions. The importance of remembering not everyone speaks English as a first language and how we need to consider this when delivering technology solutions. It’s also quite funny when as a Kiwi I had a language issue of my own trying to communicate with an American outside a homeless shelter in the old part of Seattle, we both spoke English but honestly had no idea what each of us was saying! I’ve met MVP’s from all over the world. Pakistan, Singapore, UK, Netherlands, India, Brazil, China, Australia, South Africa, Spain, Italy, Sweden, Belarus, Israel, German, Canada and of course the United States. These people are all passionate about both technology and community. Last but definitely not least, the Microsofties . They are really easy to engage with, they take time to listen and you never feel like you’ve asked a dump question. During the networking events, I had the opportunity to have conversations directly with people from the Product Groups and the MVP community team. These girls and guys rock! The toughest thing about this event is that you see a lot and then have to keep what you’ve seen to yourself. All I can really say is that I am excited about what I’ve seen and look forward to seeing some of these things being available over the next year. Microsoft really are listening to their users! The Office 365 Roadmap site is a good place to learn about upcoming features not covered by NDA. Thank you Microsoft for inviting me to this amazing event. It really has been a great opportunity filled with inspiration, insightful talks and great networking opportunities. I feel inspired and we haven’t finished yet! Why is Office 365 going slow? Is your Office 365 running slow at random times? Does it seem to happen at work but be fine from home (or some other location)? Here is a short check list to help diagnose the problem. Where is your Office 365 Tenant located? Make sure your tenant is hosted in a location that makes sense. For us New Zealanders, the nearest location is Australia. Check the Office 365 Datacenter map. Are you behind a Firewall or Proxy Server? All Office 365 services use SSL. Firewalls and Proxy server with SSL Packet Inspection enabled can be a source of latency, especially if they are under a heavy load. Does turning off packet inspection improve performance? Does the Firewall’s console show high memory or CPU usage? This article ‘Should you use SSL Inspection’ by Forinet is a good read and applies to other vendors too. In New Zealand some ISP’s limit the amount of international bandwidth allocated to each customer. If you have a large number of users, this could be a bottleneck. Talk to your ISP about the bandwidth allocation. Some may also have Office 365 specific plans. Express Route is another technology that can improve performance for Azure and Office 365. See Microsoft’s Express Route partners and peering locations document. Talk to your ISP about Express Route. Are you connecting across a WAN to your company internet connection? If you are working from a branch office, then your internet traffic may be passing over a WAN link before getting to the internet. How much bandwidth do you have and are you sharing it with other traffic? Are you slowing down when someone prints a big file? Wireless network. Is the issue related to your WiFi only? Your PC (or Mac). Is the problem specific to one device? Run a speed test on your internet connection. Are you over your data cap? For a details example of how to troubleshoot Office 365 performance, read this article from Microsoft Premier Support. There are other reasons Office 365 might be running slow, but in my experience most issues relate to the environment users are in. Try to eliminate the easiest things first. Have you ever needed a low cost solution for capturing data in a form on mobile device and then pull the data back into an in house SQL database. In this solution data is entered into an InfoPath form on a tablet (Windows, iOS or Android), submitted to a SharePoint Online form library and then pulled into a SQLserver database using SQL Integration Services (SSIS). This solution will also work with standard SharePoint lists and can be used with SharePoint Online, SharePoint 2013 or SharePoint 2016. InfoPath can ‘promote’ fields from the form into metadata fields in the SharePoint Online forms library e.g. each form will be saved and selected fields will appear as columns on the form library. Using InfoPath Designer, create a form and publish the form to a SharePoint Form library. The easiest option is to do this from InfoPath and let it create the Form library for you. In Form Options, select the fields that you want to ‘promote’ to SharePoint. In this step we setup a database and SSIS package. The connection is initiated from the server running SSIS and so this server must be able to make an outbound connection to Office 365. Once you have tested the process (see steps below), you can schedule the SSIS package to run on as frequently as you need. When creating the oData connection to Office 365, you must manually change the setting for ‘Microsoft Online Services Authentication’ to true. This is in the oData Connection Manager settings, under Connection in the Security section. More details here. I’ve been watching a little revolution taking place over the past few months. I’ve noticed a few people in my wider circle (human, not Google+) becoming a little bit “Mac-curious”. They’re starting to ask questions like, should I buy a Mac or a PC? The answer is of course depends on what you want to use the computer for…A few years ago, if the answer was “work” then for 95% of people a PC was the right choice. My own recent experiences seem to make that line a blurry. In my day to day job, I am a company Director and an IT Consultant working largely with Microsoft Technologies with a major focus on SharePoint and Office 365. Here’s a few things I’d like to share about my experience of working with Office 365 from a Mac. Using nothing more than a Mac Book Pro (13 inch retina display) and an internet connection at the office, paired to my phone and a variety of Wifi locations including home, airports and cafes, I can get my work done. No hassles, it just works! I have Office 2011 for Mac installed locally, but actually I hardly need it. The Office Web Apps are great, far better than Google Apps (yep I’ve use them daily too). I love the Excel and Word Web Apps. Pair these two work horses with Outlook Web App and SharePoint and I can do almost everything I need for my day to day work. The experience is the same as if I was on a PC. I can drag files from my local machine to a SharePoint document library. I can sync files locally using the Mac One Drive client. I can edit without compatibility issues. I can print without wonky formatting. It just works. 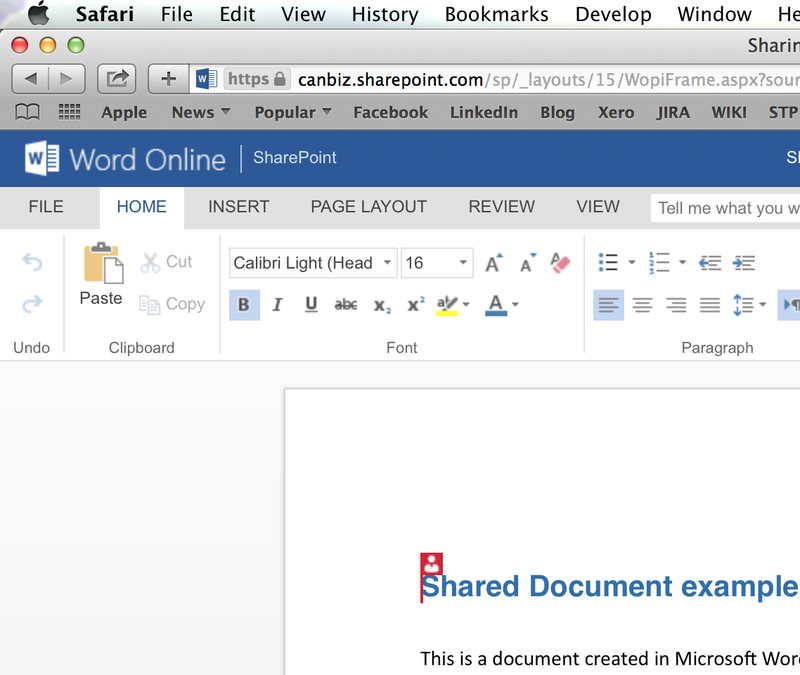 Office for Mac includes Word, Excel, PowerPoint and Lync. It has some limitations so do your homework, particularly if you need VBA or third-party add-on support. I still have a few little things that work better on a PC, particularly connectivity into a few of my clients, however the Microsoft now providing a great RDS Client for Mac, I hardly ever need to boot into Windows. I would like to congratulate the folks at Redmond for providing great Mac OSX support. I see this as a real positive for Microsoft as many of their services are now accessible to people using other platforms including iOS and soon Android support for Office. Nice one!